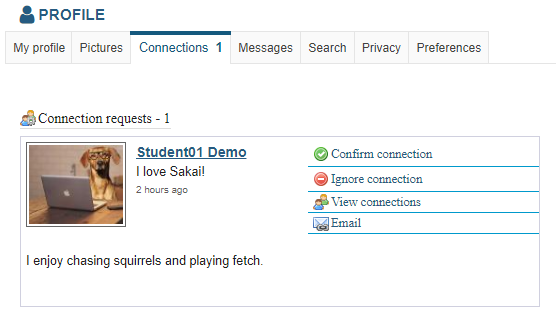 Sakai Guides and DocumentationSakai Complete User Guide ProfileHow do I accept a connection request? Any pending connection requests that you have received will be listed here. Select Confirm connection to accept the request. Click Confirm connection to accept the connection request from the selected user. Select Confirm connection requests again to verify your selection. Next: How do I send a message to a connection in Profile?